Eagerly anticipated but horrendously expensive on its launch, the Fazer needed a price cut before gaining the popularity it deserved. But what about a used one? When it was launched back in 2001, the Fazer 1000 was being touted as a sports bike alternative. In reality it was very close to a sports bike, but mainly on price: a whopping £8100, or nearly £1900 dearer than the Bandit 1200! An R1 was only a grand more. A year later Yamaha took the hint and lowered the price to a 'mere' £7234. Suddenly, it all made more sense and the bike began to pick up a good following. 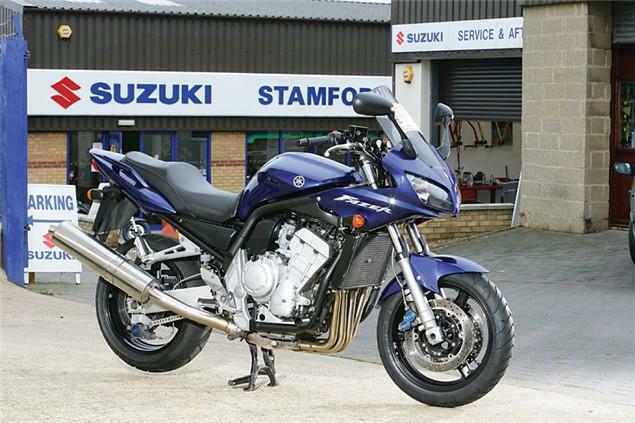 It was still pricier than the Suzuki Bandit, but it was more modern and higher-spec. It also offered a few more creature comforts than the Honda Hornet 900. But it was never really an alternative to a sports bike - the Fazer was always a bit wibbly-wobbly at speed to be that - but there's much you can do to pep-up the handling and the motor. Derived from the early YZF-R1 motor, this powerplant is probably one of the finest carburated motors ever. Smooth, like a turbine, the power builds effortlessly after a little dip at 5500rpm to take off towards a rear wheel figure of around 120bhp. With a top end approaching 160mph, the Fazer is easily tuneable to 130-140bhp without major problems. Servicing intervals are every 4000 miles. Oil consumpion isn't in Daytona 675 territory, but thrashed motors burn oil in a similar way to older Yamahas. Nothing to worry about but needs watching. Sadly, the beefy R1 clutch didn't make it over to the Fazer, which gets a smaller one. This means mildly-tuned Fazers can burn out clutches in swift order. 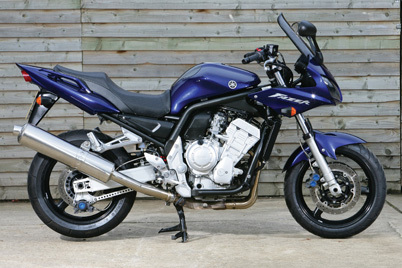 A number of 2001-2002 model Fazers had poor quality header pipes, which led to premature 'blueing' of the downpipes. Yamaha replaced them under warranty, but only on request. These will stick if neglected and not cleaned. Having a smaller radiator than the R1 means that in very hot conditions the fan can be on for prolonged periods. This isn't a problem, it's just doing its job. The front is way too soft and the shock loses its damping and feels tired after as little as 6000 miles. Here's where you should spend your money. Either go for a spring suited to your weight (around £60-£80 fitted), re-valve/service the shock (around £100-£160) or have the shock re-built by a reputable company (try K-Tech on 01530 810625) for around £300 or buy a new shock for £400-£600. Many owners also fit new suspension linkages to stiffen up the rear end a little. Many two-up Fazer riders think rear suspension work is vital. At the front owners drop the forks through the yokes 5-10mm to quicken up steering and also go for new springs and oil to change the front's soggy characteristics. Niall Mac's preferred settings at a Jerez test on the Fazer 1000 many moons ago were, front: drop forks 5mm through yokes. Compression: five turns back from max. Rebound: six turns back from max. Preload: maximum. Static sag: 24mm. Rear: compression three turns back from max. Rebound: maximum. Preload: 10mm of static sag. Good, but not quite as good as the R1 from which they were taken (smaller master cylinder, different pads y'see). Like its smaller brother, the first-generation Fazer 1000 has some finish issues. Engine paint can flake and many owners have had engines repainted under warranty. For those unfortunates who find the paint flakes just after the warranty period, the bill will be around £400 if you want an engine-out job. Paint is also known to flake off the frame rails. For both jobs there's an answer: touch-up paints. You can get 'em for around £75 from Yamaha, or try RS Paint (01226 203608). They sell paint for around £50 in frame and bodywork colours. Very comfortable. The only thing that may rankle will be the screen, which - as standard - some find too small. Plenty of larger replacements are available. Depending on how hard you twang the loud handle, you'll have around 120-150 mile range before reserve from the 21-litre tank. Still reasonably strong for a six-year-old machine with early models commanding a few quid over three grand. There's no real line in price between a 2001 and a later model, as dealers tend to value them more on condition than age. If you want to buy one simply aim for the best you can find. In general, many touring, two-up merchants will keep their machine in better nick than more sports oriented riders. The new version isn't looking so strong, with naked FZ1s already going for around £5400 (just £400 dearer than '05/'06 Mk1 versions) and dealers punting out pre-reg'd '06 models of the faired FZ1 for £5999! You'll have enough change to sort the dodgy fueling out. A much-modded machine, the Fazer 1000 ranks up there with the Bandit and GSX-R series for the amount of tat and good stuff you can get for it. Huggers and fender-extenders are good, but do visit owners' websites to find out what fits well and what doesn't. There's a lot of variation in the quality, but choosing a hugger with the lower flap to keep the shock clean is a good idea. Belly-pans are popular, but if you do track days beware ones that may touch down - check with owners to find out first. Crash bungs are popular, with MOKO, BSD and Harris being among the most fitted. Radiator guards keep the rad in tip-top shape (please avoid the uber-naff ones with 'Fazer' laser-etched in them). End cans are also popular, but do ask if the owner has had any jetting changes or set-up time on the dyno. Taller, flip-up and double-bubble screens work, as does some decent suspension work. None reported on the Vehicle Inspectorate website. Comments: Yamaha's R1 engine and brakes meets a tubular chassis, Thunderace swingarm and soft but adjustable suspension. Overpriced at first, with a lower ticket it was eventually loved by scratchers and tourers alike. The original series one Fazer changed little in its four-year span, save for bodywork colours and mid-series machines having dark grey paint on the motor. Comments: Naked replacement for the series one Fazer gels awesome GSR-alike looks to coughy, snatchy motor (albeit with a searing top end) and harsh suspension. Comments: The half-faired version of the above and therefore the real replacement for the original. As with the FZ1, this has the power, but not the smooth grunt of its predecessor. Engine: Derived from the early YZF-R1 motor, this powerplant is probably one of the finest carburated motors ever. Smooth, like a turbine, the power builds effortlessly after a little dip at 5500rpm to take off towards a rear wheel figure of around 120bhp. With a top end approaching 160mph, the Fazer is easily tuneable to 130-140bhp without major problems. Servicing intervals are every 4000 miles. Oil levels: Oil consumpion isn't in Daytona 675 territory, but thrashed motors burn oil in a similar way to older Yamahas. Nothing to worry about but needs watching. Clutch: Sadly, the beefy R1 clutch didn't make it over to the Fazer, which gets a smaller one. This means mildly-tuned Fazers can burn out clutches in swift order. Visordown Marketplace bike of the week!